REMEMBER: as you go through this tutorial, you can click on any picture to see it larger. 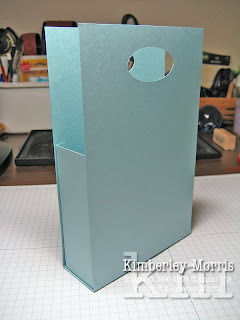 You will use ONE full sheet of 8-1/2" x 11" card stock to create the card pouch itself. Additional card stock will be necessary for embellishment. 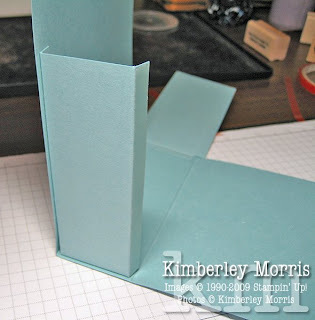 First you'll want to cut two 4-1/2" x 8-1/2" pieces from your sheet of card stock. 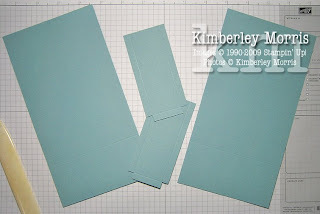 These pieces form the front and back of your box, so if you would like to decorate the background of these pieces, with Texturz Plates or Stampin' Around wheels, this is the time to do it! 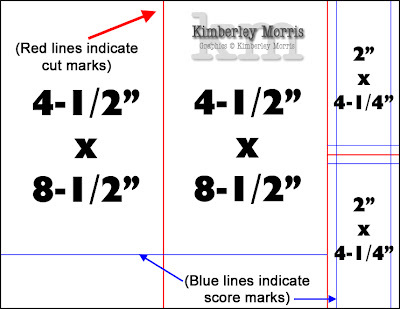 On each of these two 4-1/2" x 8-1/2" pieces, you will make one score mark 1-1/2" into one side of the card stock, parallel to the 4-1/2" side. 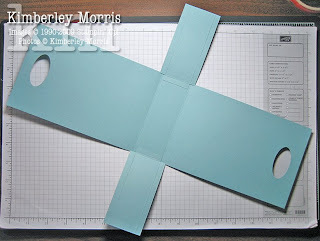 The area from the score mark to the end of the card stock (approximately 1-1/2" x 4-1/2") will be the bottom of the project, so it's okay if your decoration does not extend all the way across that part. 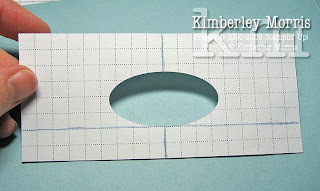 Next, you'll want to punch holes in the top of each 4-1/2" x 8-1/2" piece, to use as a "handle", to tie the box closed. The top of each piece is the end farthest away from the score marks. 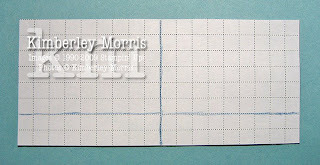 The easiest way I've found to place a punch hole exactly where I want it, is to create a template out of grid paper. All that's left is to place Dotto (temporary adhesive) on the back of the template, and stick it to the top of the 4-1/2" x 8-1/2" piece of card stock, lining up the edges of the grid paper with the card stock, as shown below. Remember, the top is the end farthest from the score mark. You can see exactly where to punch the hole now. 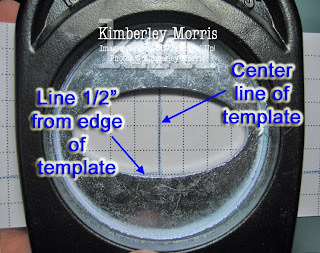 You can either leave the template in place and line up the punch to punch inside the hole, or you can trace the punched out area with a pencil, if you don't want to risk over-punching into your paper template. 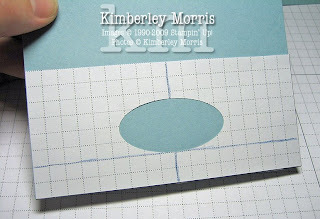 Remove the grid paper template, and place it on the other 4-1/2" x 8-1/2" piece, and punch the second handle hole. Next, place adhesive onto the scored edges of each side piece, as shown below. 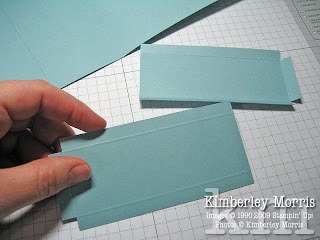 If you use Sticky Strip, you may find it is just slightly wider than the area your scored tab will allow for adhesive. In this case, you can trim your Sticky Strip down the center lengthwise, and use half as much as I did on mine! 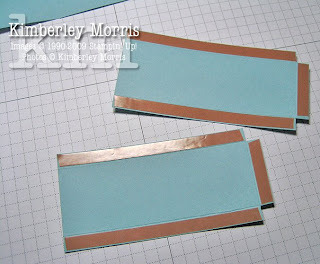 Remove the red liner from each piece of Sticky Strip as you get to it. You do not want the adhesive exposed before you are ready to join the pieces, or you might accidentally join tabs at the wrong place. I find it easiest to adhere the bottom tab of each side piece, to the bottom of the pouch first, as shown below. 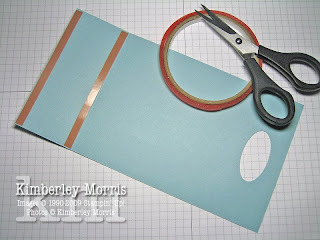 After you adhere the bottom part of each side, then pull the sides of the box up and one by one remove the red liner from your Sticky Strip, carefully line up your pieces, and press to adhere. Once all the side piece tabs are adhered, you may wish to take your bone folder and reach it inside the pouch, and press on the back side of the tabs to burnish the card stock into the adhesive. This provides a more secure holding. 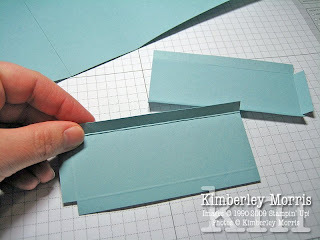 Decorate the front of the box as desired, and loop ribbon through the handle to close the card pouch. The front looks beautiful when embossed with Texturz Plates, or stamped with a wheel in a coordinating color, prior to assembly. 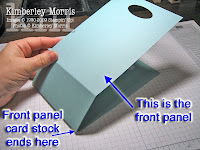 Experiment with rounding the corners, or punching partial shapes away from each corner (i.e., with the Designer Label punch) to add interest and elegance. You should be able to fit 8-12 standard cards, plus their envelopes, in this box--depending on the amount of layering you use on your cards. This card pouch, filled with handmade cards and coordinating decorated envelopes, makes an excellent Mother's Day gift! Just remember, if you are giving away notecard sets, you'll want to be careful with your embellishments. Anything that makes a card over 1/4" thick, or which causes a significant protrusion from the card, may result in the following: sender may have to apply extra postage to the card, recipient may receive the card postage due, or, a protruding embellishment may be caught in a postal machine and mangle the envelope and/or the card. Stampin' Supplies: Great Friend stamp set, Baja Breeze card stock and ink, Whisper White card stock, Top Note Sizzix Die, Walk in the Park Designer Series Paper, Kiwi Kiss ink, Bordering Blue ink (for the butterfly), Mini Glue Dots (rolled up and placed along fold of butterfly to adhere), Kiwi Kiss/Vanilla Ribbon, Stampin' Sponge (for Baja Breeze along top of die cut), Stampin' Dimensionals (to adhere Top Note), Large Oval Punch, Corner Rounder Punch, 1-1/4" Pink Pirouette Ribbon (1" Baja Breeze Double Stitched would also be great here! ), Sticky Strip, Paper Snips, Bone Folder & Fiskars Trimmer (for making score lines), Grid Paper, Dotto. Starter Kit in 3 Easy Payments -- APRIL ONLY! 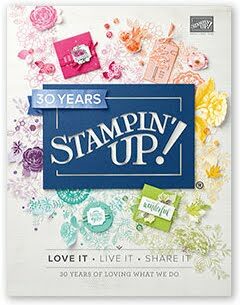 During the month of April, you can become a Stampin' Up!® Demonstrator with a payment of as little as $66.34 (+applicable tax). Complete your kit purchase with two more payments of approximately $66.33 each, on or about the 15th of May and June. Click HERE to download a packet with all the details, instructions, and forms you will need to submit in order to become a demonstrator. The most important bit of information you need to know is that this offer is NOT available online--Stampin' Up! must receive your application and order form (at their P.O. Box address) on or before April 30th. 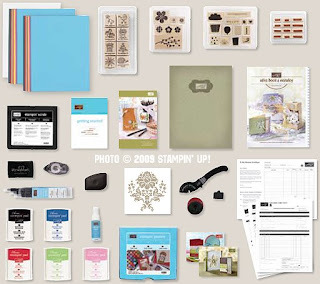 You may also choose a Stampin' Memories Add-On Kit to supplement your Standard Starter Kit. This Add-On Kit includes 12"x12" card stock, an alphabet stamp set, an archival Craft stamp pad, an archival journaling marker, and a Simply Scrappin® scrapbooking kit. As with the Standard Starter Kit, there are some customization options available for the Stampin' Memories Add-On Kit. Again, all the details you want and need to know may be found in THIS PACKET. Please feel free to email me, or call me at 719-205-5957, with any of your questions. 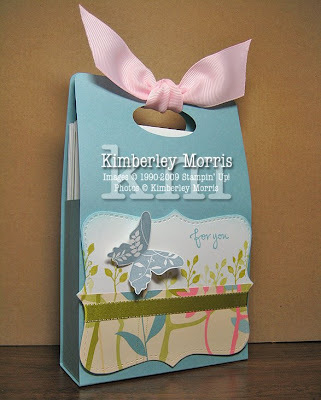 *This offer valid only through Kimberley Morris, Stampin' Up!® Independent Demonstrator. During the month of April, earn one FREE "Under $10" item from page 208 of the Spring-Summer Idea Book & Catalog, for every $40 in Occasions Mini Catalog merchandise purchased! That's up to nearly a 25% return on your order!!! Hostesses during April may also choose one Under $10 item for FREE, for every $150 in customer merchandise purchased (from any current catalog) on their workshop. There are two Mini Note Kits to choose from, which include 4 Gift Note Cards & Envelopes, 2 stamp images, and a Chocolate Chip Ink Spot. 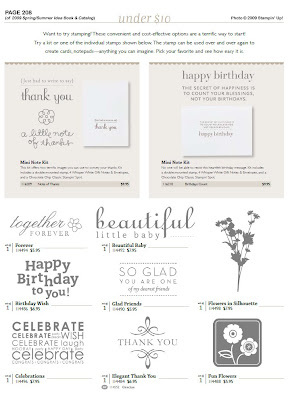 You may also choose from eight different single stamps, and mix & match to cover a variety of occasions. Get connected with your friends, neighbors and relatives this month, using hand-stamped note cards! Drop me an email to place your order, call me at 719-205-5957 to place your order, or place your order directly through my ONLINE STORE (Open 24/7!). Several of the free Under $10 images would lend themselves quite nicely to 'thank you' notes for your child's teacher at the end of the school year, which is coming right up. Match them with your $40 in Occasions Mini Catalog merchandise to make some darling cards! *Online Orders will receive their free items in a separate shipment, please allow 2-3 weeks for processing and shipping. Color assortment of blank stationery kit will be Demonstrator's choice. This special only valid through Kimberley Morris, Stampin' Up!® Independent Demonstrator.